The order Odonata ("toothed ones") includes some of the most ancient and beautiful insects that ever roamed Earth, as well as some of the largest flying invertebrates ever to have lived. Odonata consists of three groups: Anisoptera (which includes dragonflies), Zygoptera (which includes damselflies), and Anisozygoptera (a relict group represented by only two living species. This order is very diverse with about 5000 species, and its members are easy to observe. Adult Odonata : At left, an adult dragonfly (Anisoptera). Notice the relatively stout body, and the wings extending to each side while the dragonfly is perched. At right, an adult damselfly (Zygoptera). Damselfly bodies are slender by comparison, and wings are held above the body while at rest. Both dragonflies and damselflies belong to the Odonata, which is a subgroup of insects, which in turn is a group of uniramian arthropods. 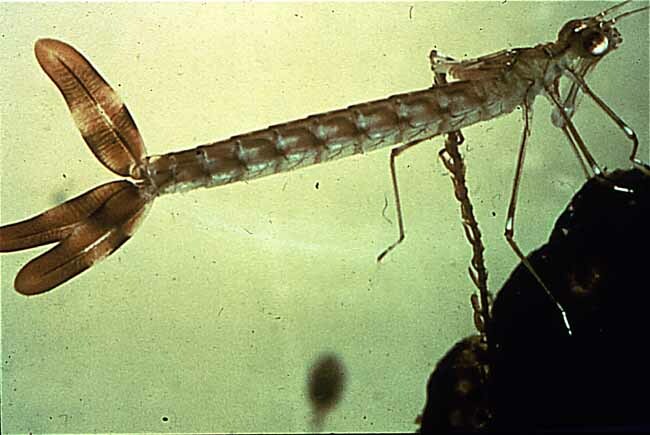 Many characteristics distinguish Odonata from other groups of insects -- minute antennae, extremely large eyes (filling most of the head), two pairs of transparent membranous wings with many small veins, a long slender abdomen, an aquatic larval stage (nymph) with posterior tracheal gills, and a prehensile labium (extendible jaws underneath the head). Among living Odonata, there are twenty-five families, mostly dragonflies and damselflies. Of all their characteristics, the easiest way to tell a dragonfly or damselfly from other insects is by the size of the eyes and shape of the abdomen. If the eyes are very large in proportion to the head and the abdomen is long and thin, then it is almost sure to be in Odonata. While both dragonflies and damselflies belong to the Odonata and share many common features, then are a number of noticeable differences as well. Even before hatching from the egg, differences in morphology of the egg distinguish dragonflies (Anisoptera) from damselflies (Zygoptera). Dragonfly eggs are round and about 0.5 mm long, whereas damselfly eggs are cylindrical and longer, about 1 mm long. Similarly, the nymphs (larvae) of the two groups differ. A larval damselfly abdomen is longer and narrower with three fin-like gills projecting from the end. Dragonfly nymphs are shorter and bulkier, and the gills are located inside the abdomen. The dragonfly nymph expands and contracts its abdomen to move water over its gills, and can squeeze the water out rapidly for a short burst of underwater jet propulsion. Larval Odonata : Dragonflies and damselflies begin their lives as nymphs, living underwater for a year of more. On the left, a damselfly nymph, recognizable by the three feathery gills extending from the tip of its abdomen. On the right, a dragonfly nymph, whose abdomen ends in three short spines and whose gills are held internally. 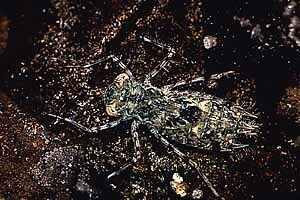 The nymphs are not as brightly colored as the adults, but are well camouflaged predators who ambush their prey. Both major suborders have large heads with very large compound eyes relative to the rest of their body. Each compound eye is composed of nearly 28,000 individual units (ommatidia), and together the eyes cover most of the head. More than 80% of their brain is devoted to analyzing visual information. By contrast, their antennae are tiny. Their mouths have been adapted for biting, making them efficient hunters. All Odonata have a prehensile labium, which can be extended forward from underneath the head faster than most prey can react, making their bite fatal to prey. The six legs are all located near the head and are seldom used for walking, but are more useful in catching prey and perching on vegetation to rest or lay eggs. Both dragonflies and damselflies have two pairs of elongated membranous wings with a strong crossvein and many small veins that criss-cross in the wings, adding strength and flexibility to the wings. Both groups also have a characteristic nodus, or notch, in the front edge of each wing. In dragonflies, the rear wings have a broader base and are larger than the front pair. Damselflies, by contrast, have front and hind wings similar in shape, and as a result they fly slower than dragonflies do. Also, dragonflies do not have hinges enabling them to fold their wings together when resting, though damselflies do. This feature of the wings is the key morphological feature distinguishing adult dragonflies from damselflies. Dragonflies can fly forward at about 100 body-lengths per second, and backwards at about 3 body-lengths per second. They are also capable of hovering in the air for about a minute. Longer periods of stagnant flight would interfere with thermoregulation. 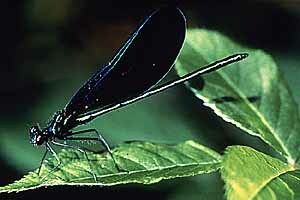 The wings of male dragoinflies are relatively longer and narrower than females in large species. Adult wingspans measure from 17 millimeters (Agriocnemis) to 20 centimeters (Coerulatus). Most temperate zone species have wingspans of 5 to 8 centimeters and wings that are from two to twelve centimeters from front to back. 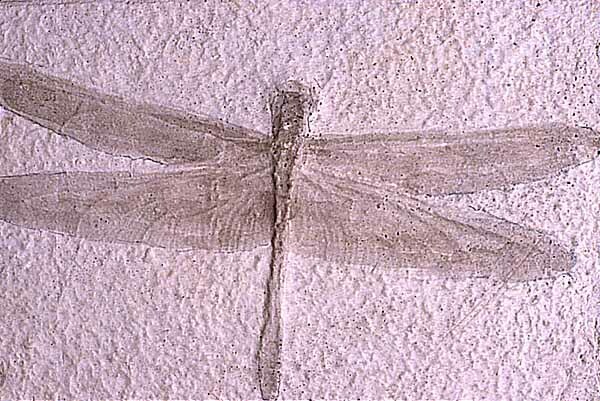 Ancient wings : A fossil of Protolindenia wittei, a dragonfly with a wingspan of about 15 cm. This exquisitely preserved specimen comes from the Jurassic Solnhofen limestones of Bavaria, Germany, and is about 155 million years old. 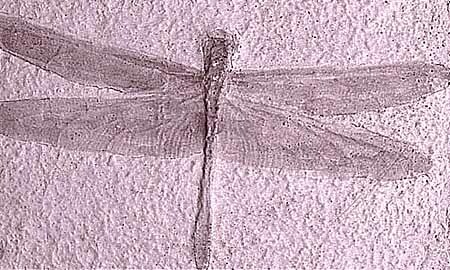 The oldest fossils of Odonata are more than twice that old! The Odonata are known to be ancient insects. The oldest recognizable fossils of the group belong to the Protodonata, an ancestral group that is now extinct. The earliest fossils so far discovered come from Upper Carboniferous (Pennsylvanian) sediments in Europe formed about 325 million years ago. Like modern-day dragonflies, the Protodonata were fast-flying with spiny legs that may have assisted in capturing prey; their wingspan was up to 75 centimeters (30 inches). The group went extinct in the Triassic, about the time that dinosaurs began to appear. Fossilized specimens of another group, the Protoanisoptera (family Meganeuridae), have been found in limestone at Elmo near Abilene, Kansas, USA. 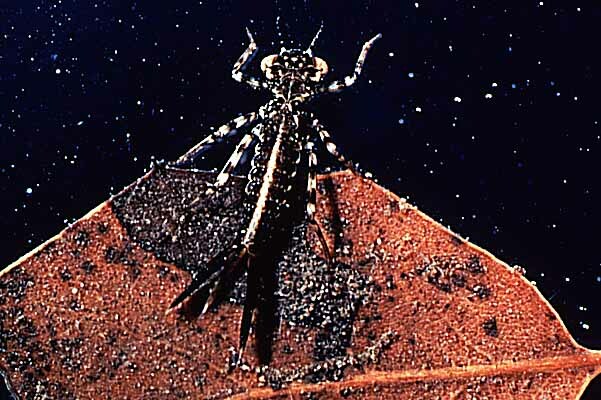 The Meganeuridae differed from modern Odonata in a number of ways -- they lacked a nodus (wing notch) and pterostigma (features of the wings) and were enormous compared to modern species. Fossils of these insects with seventy centimeter wingspans have been found in Commentry, France, and a fifty centimeter specimen was found in Bolsover in Derby, both in Carboniferous layers. Though the Carboniferous specimens are the oldest fossils of this group found to date, they were not the first specimens to be discovered. The first Odonata fossils were found in sediments from the Lower Permian, over 250 million years old. These fossils are not huge monsters like the Carboniferous fossils, but belong to relatively small Protoanisopterans and Zygopterans (damselflies). The latter seem to have changed little in structure and appearance since then. However, it is currently a question of debate as to whether members of Protodonata and the earliest Odonata had aquatic larvae, as do all modern species, since no Paleozoic larvae fossils are known. 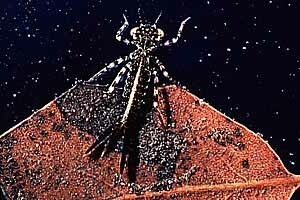 Larvae do not exist as fossils before the Mesozoic. Some workers believe that Odonata adopted an aquatic larval stage during the Lower Permian, perhaps because their prey lived in aquatic habitats. In any event, several groups of Odonata existed by the Late Paleozoic, though only three members of this group survive today. Generation gap : On the left, the nymph (larval form) of a damselfly. Notice the three large gills that the animal uses to "breathe" in its underwater environment. On the right, an adult dragonfly laying eggs. The transformation to the adult form sheds the gills in favor of two pairs of wings. Dragonflies are generalists, that is, they eat whatever suitable prey is abundant. Oftentimes, they hunt in groups where large numbers of termites or ants are flying, or near swarms of mayflies, caddisflies, or gnats. According to most studies, the main diet of adult odonates consists of small insects, especially Diptera (flies). 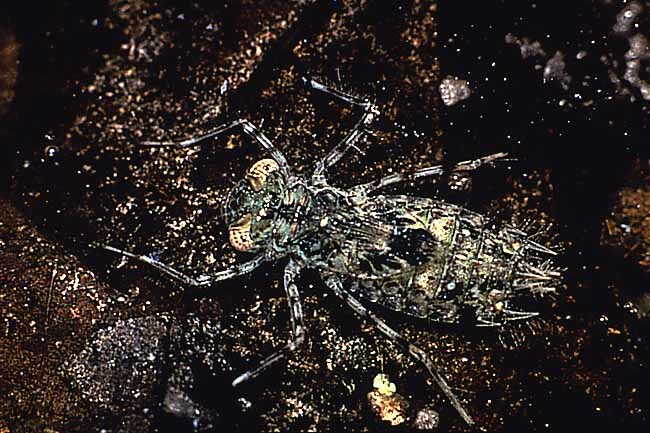 Maturing dragonfly larvae feed very intensively, as do females when developing their eggs. Studies show that food shortage may limit reproductive behavior. Dragonflies do not hunt in cold weather. Damselflies, however, are not as limited by temperature and have been observed hunting during cold spells. Males are territorial, sometimes patrolling for prey for hours at a time. Though dragonflies are predators, they themselves must be wary of many predators. Birds, lizards, frogs, spiders, fish, water bugs, and even other large dragonflies have all been seen eating odonates. However, dragonflies have many adaptations enabling them to avoid predation. They have exceptional visual responses and truly agile flight. Although many insects perform courtship, it is uncommon among dragonflies. Anisoptera copulate while in flight, the male lifting the female in the air. Zygoptera copulate while perched, sometimes flying to a new perch. The length of time required for copulation varies greatly. Aerial copulations may last mere seconds to one or two minutes. Perched copulations usually last from five to ten minutes. Intraspecific competition amongst males for females is fierce. It has even been discovered that in some species of Odonata, the males will remove all the sperm of rival males from a female's body before transferring his own sperm. These species are equipped with a "scoop" at the tip of the male's abdomen that is used for this purpose. The distribution of various groups and species of Odonata is highly variable. Some genera and species are widespread while others are highly local in their distribution. Some families are restricted to cool streams or rivers, others to ponds or still clear waters, and some to marshy places. The presence of dragonflies and damselflies may be taken as an indication of good ecosystem quality. The greatest numbers of species are found at sites that offer a wide variety of microhabitats, though dragonflies tend to be much more sensitive to pollution than are damselflies. Many ecological factors affect the distribution of larvae. The acidity of the water, the amount and type of aquatic vegetation, the temperature, and whether the water is stationary or flowing all affect the distribution of Odonata larvae. Some species can tolerate a broad range of conditions while others are very sensitive to their environment. The International Odonata Research Institute is devoted to the study of dragonflies and damselflies and is part of the Odonata Information Network. For lots of information and links about Odonata, try the Oregon Dragonfly and Damselfly Survey. 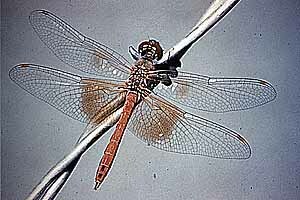 Or you might prefer to view picture galleries at the more modest Dragonfly website or these Odonata Photograph Archive from the University of Michigan Museum of Zoology. For more on the systematics of dragonflies, damselflies, and their extinct relatives, visit the Tree of Life. A number of odonate species are currently endangered. 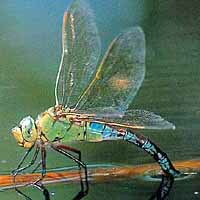 To learn about one endangered species, Hine's emerald dragonfly, visit EE-link's Endangered Species website. Most images on this page kindly supplied by Dr. Vince Resh. 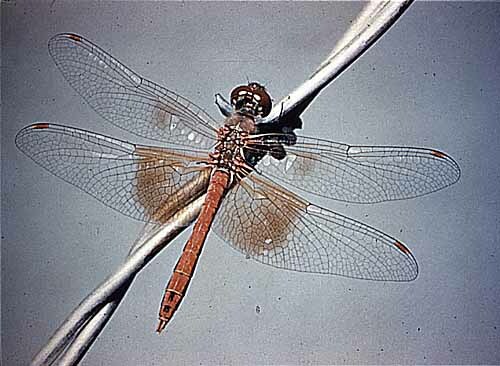 Photo of adult dragonfly resting after emergence obtained from a public domain collection. Photo of Protolindenia from a cast in the UCMP collections. D. Allen, L. Davies, & Pamela Tobin, 1984. The Dragonflies of the World: A Systematic List of the Extant Species of Odonata, Vol. 1. New York. R. S. K. Barnes, 1984. A Synoptic Classification of Living Organisms. Sunderland. F. G. Bos, 2000. The European Dragonflies: Notes on the Checklist and on Species Diversity. Odonatologica 27: 31-43. Philip Corbet, 1962. A Biology of Drangonflies. 247 pp. Philip Corbet, 1999. Dragonflies -- Behavior and Ecology of Odonata. New York. Kumar, Arun, Prasad, & Mahabir, 1981. Field Ecology, Zoogeography, and Taxonomy of the Odonata of Western Himalaya, India. New Delhi. Michael F. Land, 1997. The Resolution of Insect Compound Eyes. Israel Journal of Plant Sciences 45: 79-91. Peter L. Miller, 1987. Dragonflies. Cambridge. N. W. Moore. Territory in Dragonflies and Birds. Bird Study 4: 125-130. R. M. Olberg, K. R. Venator, & A. M. Worthington, 2000. Prey Pursuit and Inception in Dragonflies. Journal of Comparitive Physiology A: Sensory Neural and Behavioral Physiology 186: 155-162.